Flexco® Vinyl Wall Base is a great, economical wall base with quality construction and superior color finish. More economical than rubber, Flexco® Vinyl Wall Base is constructed of type TV vinyl and is offered in both a toe and toeless style. Quality, homogenous color and a strong finish that resists scuffing and gouging makes this Flexco® vinyl wall base a superior choice. And with over 60 color options, you are sure to find the perfect color to compliment your design! Homogenous color. Offered in 61 color options. Toe (cove) and toeless (straight) styles available in 2-1/2', 4', or 6' wall heights. Maintenance: Note: some disinfectants, cleaning agents, floor maintenance products and pesticides may stain or damage the surface of the Vinyl Wall Base. 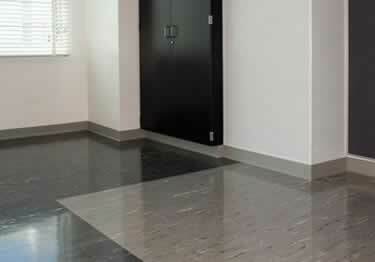 Clean the Vinyl Wall Base with a soft cloth dampened with a neutral pH cleaner and warm water solution. Rinse sparingly with water. If applying finish to flooring, take necessary precautions to keep finish from the Vinyl Wall Base. If applying finish to the Vinyl Wall Base, test inconspicuous area first for compatibility. Hi. I have a basement that I am finishing that has flooded an inch or two on a few occasions. I am looking to install vinyl plank flooring and am thinking I need to cut out at least an inch from the drywall in a few places. I was thinking maybe a vinyl molding with the vinyl plank flooring. Is this an application you have seen? How do you install your molding if it is drywall on the walls? If I cut out an inch or two from the base of my wall, how would I install the molding? Thanks. Can you purchase a five or six inch wide in this baseboard that has the adhesive on it? Do not want to have to put glue on it. Is toeless no angle on the bottom of the piece? Flexco Vinyl Wall Base in 1/8" or 0.080" gauge provides quality construction with a scuff and gouge resistant finish. Available in 2-1/2", 4", 6" heights and 61 colors. Sold in 4ft strips or 120ft rolls. This product made our rooms look complete. It was easy to install and a great way to transform the complete look of the room without having to use wood. Thank you for your review. We very much appreciate your feedback about the ease of installation. Yes, you're right, wall base really does transform the room. A little lighter duty than I anticipated but worked well and installed easily. This product is great for flat straight walls but I was using it in a vintage trailer restoration and it was difficult to keep adhered to curves both internal and external I thought that by using the shorter profile it would be easier to apply but I still need to caulk fill a lot of spots where it just wouldn't stay attached to the wall. I was working in the summer with all warm surfaces so temperature was not the issue. I still would recommend this product for more traditional applications. I recently had an an addition put on my home, and needed to install baseboard. I wanted to use snow white, 4" vinyl to match my interior trim, and wanted good appearance, cleaning, and durability. Having used FLEXCO for this in the past, it was an obvious choice for me. However, I found that I was unable to obtain what I sought locally, even when retailers carried FLEXCO in other colors. I was pleased to find it available from Koffler Sales Co, but was not happy to purchase twice the amount I needed, to complete my project. The addition is now complete, and with the results I expected. The 4' flat stock is easy to use, and looks great, unlike the rolled, self adhesive varieties offered to me by my local retailers. A big Thank You to Koffler Sales, and FLEXCO ! Assortment of high quality cove base installation tools to make your installation a breeze.